Reason for failed transaction is usually received as a response from Visa / Mastercard / FPX / Bank. It is beyond senangPay’s control, unless we notify merchants that senangPay is having a technical problem that affects transaction process. The bank that issued your card may decline the anticipated transaction due to safety reason – to avoid fraud. This situation usually happens when your buyer is from another country. When the buyer proceed with the transaction, the card issuer (the bank) sees it as a dangerous activity as the transaction is cross-border. This situation can also happens to customer who suddenly has a big appetite for purchase – buying items beyond their usual transaction amount, such as items costing thousands of Ringgit. A quick solution for your customer is to ask them to call their bank to permit the transaction to happen. However, do note that there are several other reasons that can contribute to this failure. The cardholder might have entered the wrong details or the purchase limit has been reached. 3D Secure Authentication is a fraud-prevention scheme controlled by VISA and MasterCard. It works by sending buyer a code or password via text message in which it has to be keyed-in on the authentication page. Transaction failure may occur here, in the event that the customer failed to key in the correct code or staying too long on the authentication page. 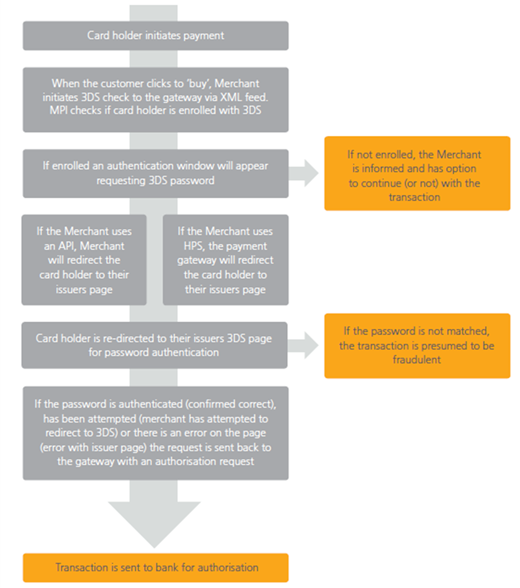 Below is a diagram on how this 3DS works, taken from www.mastercard.com. “Funds” here means the amount of money in the bank account. Your customer might have an amount lower than the price value of the desired item. For example, the item is RM2,000, but your customer’s bank account has fund that is lower than that. To overcome this situation, the buyer need to restart the purchasing process from the beginning. Make sure to not spend too much time on the authentication page. If your buyer choose to cancel the transaction…then, there is nothing that a merchant can do. Same situation here as the above. You have to let your prospective customer go. Merchant need to contact the bank involved in the transaction or merchant can ask the customer to contact their bank in order to further receiving information about the failed transaction.